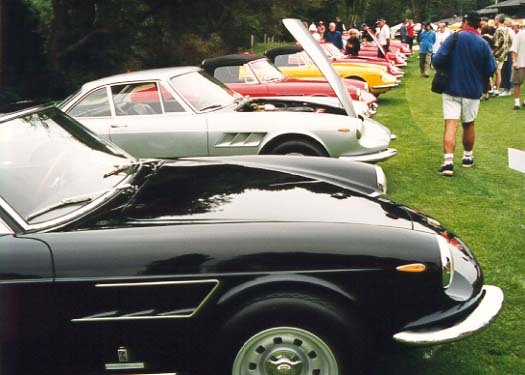 - a car freak's weekend of wretched excess! 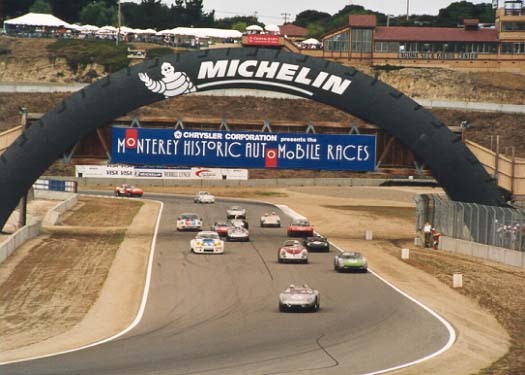 I finally decided to go to Monterey for the Hysterics (I mean Historics, sorry Steve!) 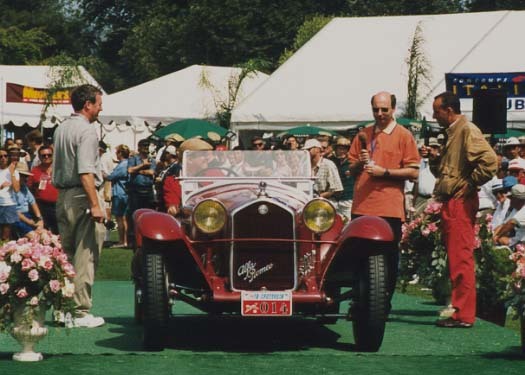 and Pebble Beach, but only because Alfa Romeo was the featured marque at Concours Italiano and many of my friends from around the world were coming. Here's a sysnosis of my trip, with links to photos. Best part of the weekend. 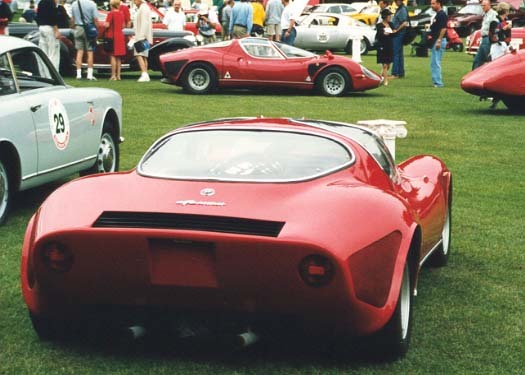 Where else could you see TWO Alfa Tipo 33 Stradales (above-both from Connecticut, BTW!). 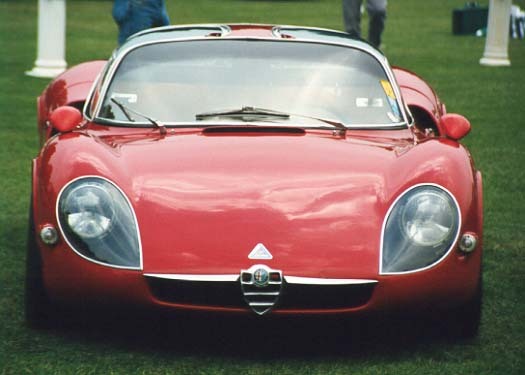 The Stradale is one wild looking car, expecially from the front. 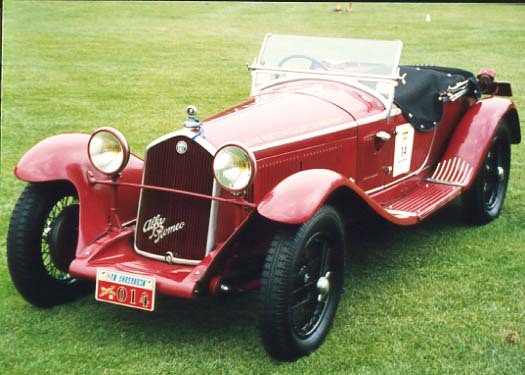 The 6C1750 Gran Sport was a nice one, and it gets some use. 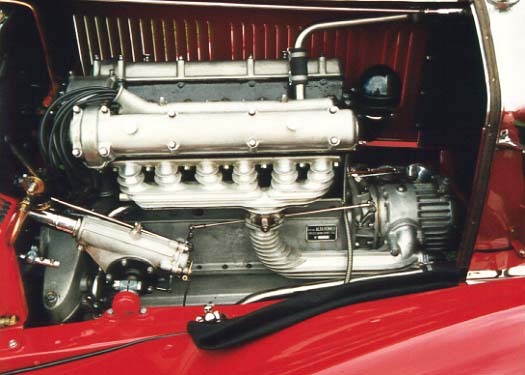 The engine is the fascinating part to me, with all the lovely aluminum castings. 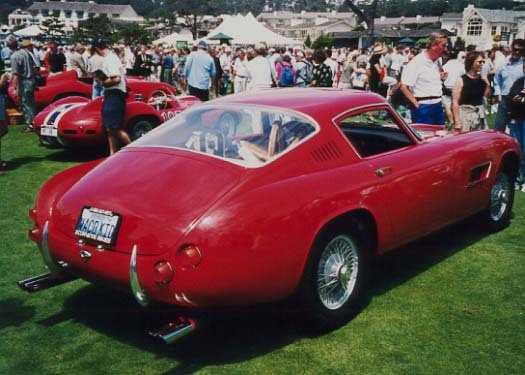 Want your own Alfa P3 GP car? This one is a bit small for me! The Ferrari exhibit was overwhelming. 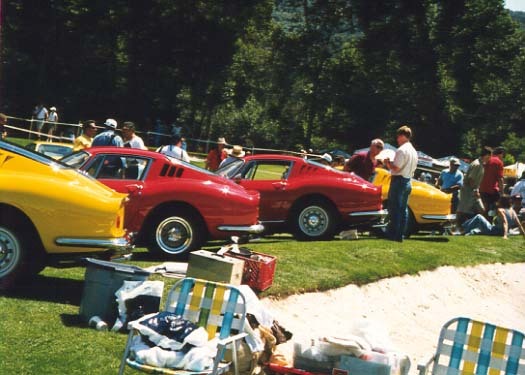 Never saw so many 275GTSs or 275GTB4s TOTAL in my life! 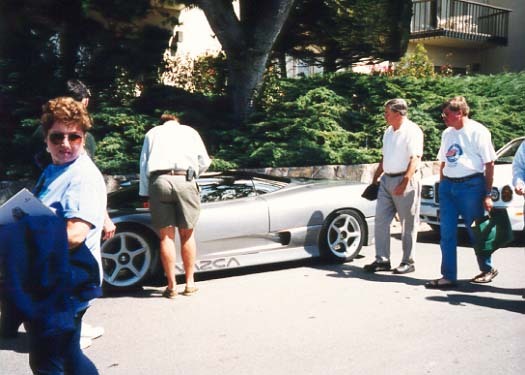 There were four F40s, an F50, even a P3/4 racecar. The newer Dinos were dime a dozen, relegated to a back area of their own! 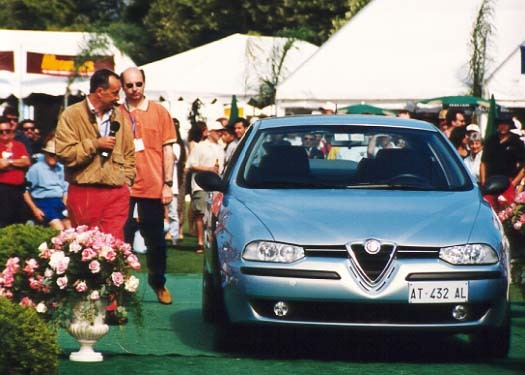 Alfa sent over a new 156 and Walter deSivla, head of Alfa design and Richard Gadeselli, VP of PR, introduced it to the crowd. Gadeselli, deSilva and Keith Martin (Sportscar Market) did the commentary on most of the cars. 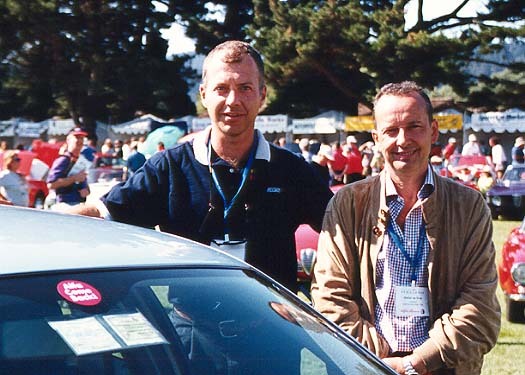 The Delta Sierra Alfa Club was giving out stickers that said "Alfa Come Back" and deSilva stuck one on the windshield of the 156, then posed with Paolo Vannini, VP of Corporate Communications for FIAT US for this photo! The "Hysterics" was certainly an "event"! 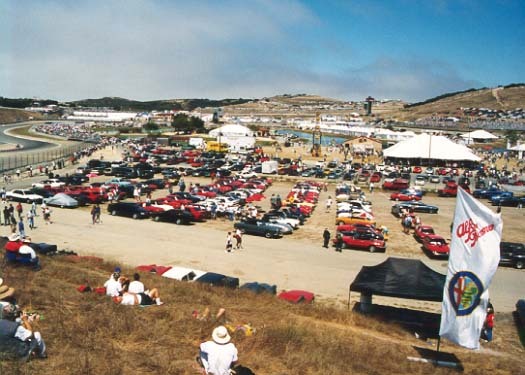 The word is that 60-70,ooo people came, including practically every Porsche west of the Rockies. 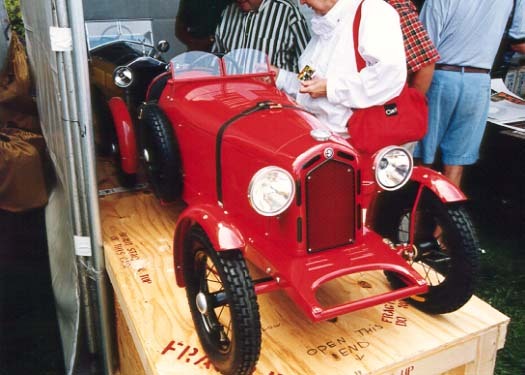 They made several exhibition classes of their own, the factory display was wonderful, and even the Alfa Romeo Association filled their corral. Honestly, I HATE watching racing - I prefer to be a participant! Wretched excess personified! Where else would you find the ItalDesign NAZCA parked on the STREET in front of a virginal white Bentley coupe? 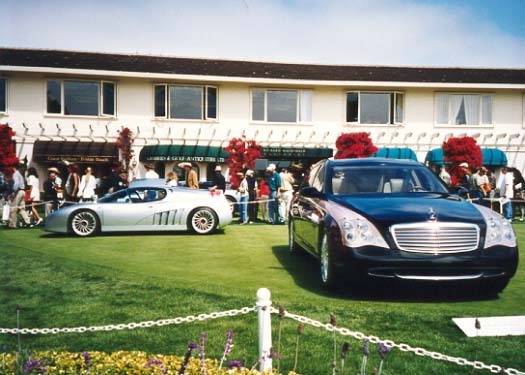 Or the Alfa Scigehra and Mercedes/Maybach parked on the lawn? And the show areas were so covered with people that you couldn't see the cars very well, but, believe it or not, this is a Corvette, by Scagelleti.